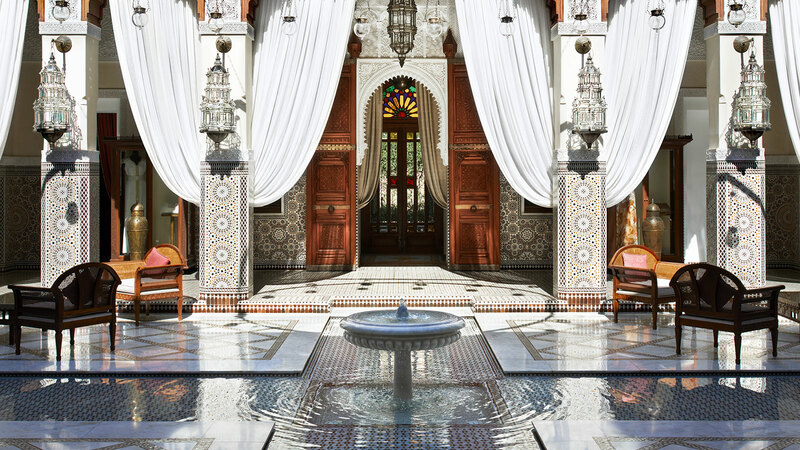 Le Royal Mansour hotel in the Moroccan city of Marrakesh is hardly a typical luxury five-star hotel. Instead it feels like a real fairytale palace. The ultra-luxurious hotel opened summer 2010 after five years of work by hundreds of skilled craftsmen, including blacksmiths, carpenters, glass blowers and master embroiderers. 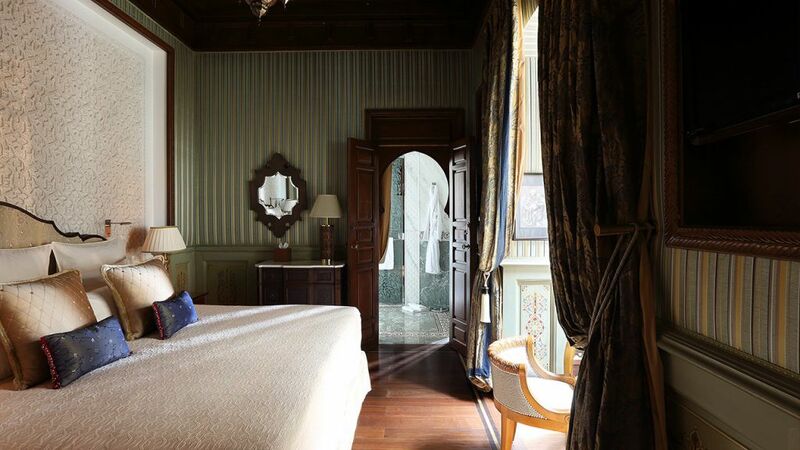 Every inch of the hotel is elaborately decorated with mosaics, 50 sorts of marble, gilding and carved wood. The mirrors come from Venice, the humidors in the cigar bar are Swiss, and the landscape design is by Luis Vallejo of Spain. Guests enter the hotel through massive copper gates and find themselves in the shade of 400-year-old palm trees. The hotel is surrounded by a five-meter-high protective wall, like a mediaeval castle, turning it into a city within a city. Each guest stays in his own “riad”, the name for a traditional house. Each riad has a simple facade with small windows and a large wooden door. But the inside windows look onto a light and airy inner courtyard. Le Royal Mansour has 53 riads, each with three floors. The ground floor has a sitting room and a dining room. 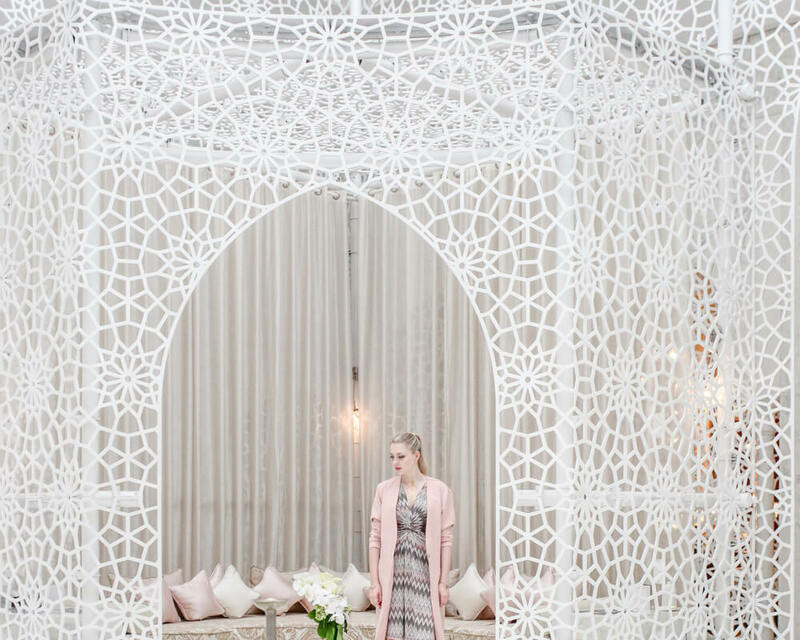 On the first floor are bedrooms with large walk-in closets and bathrooms, while the second floor is an open walled terrace with a swimming pool, surrounded by luxurious sofas, where you can have breakfast or eat dinner while admiring the sunset over Marrakesh. 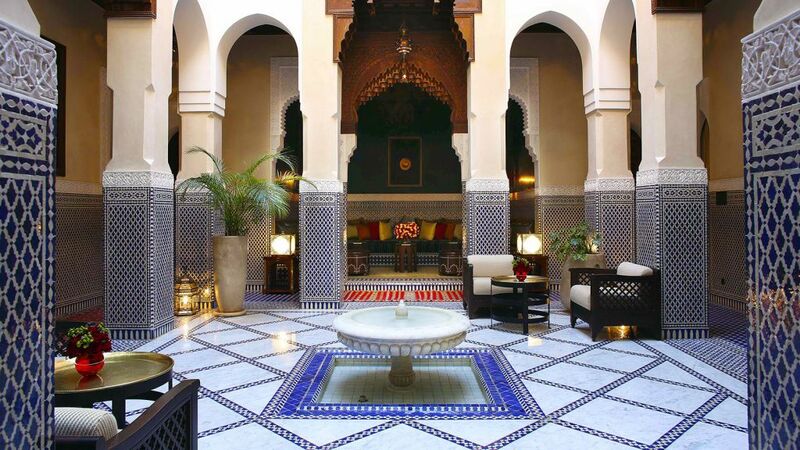 The riad is decorated in a mixture of Moorish, Arab, Berber and European styles. Every surface is richly patterned, while the furniture is intricately carved and the rooms are strewn with luxurious rugs. The service is also exceptional. The guests never even spot the service staff, who use a system of underground galleries to walk around out of sight. 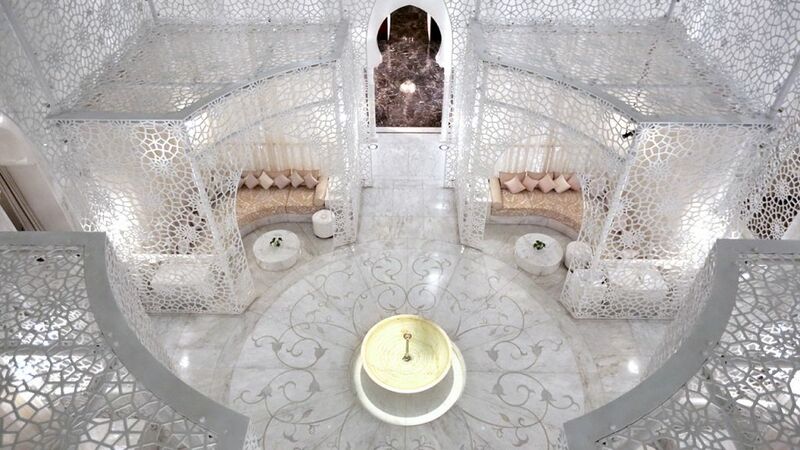 Guests who venture out of the riads can enjoy a pristine snowy-white spa and have a traditional Berber massage in the Turkish baths. The hotel also has three interesting restaurants to try. Two of them offer fine French and Moroccan cuisine.